In Los Angeles, multifamily developers are increasingly taking advantage of the city’s incentives for building next to transit stations and for including affordable units in their plans. That’s especially true when it comes to smaller constructions. Developers for four of the five most recent proposed projects requested bonuses through the Transit Oriented Communities program. The projects are larger than what have been proposed in the last several months, and if completed would add 176 units to L.A. stock of housing, 22 of which would be reserved for low-income renters. Developer David Safai wants to demolish a one-story commercial building near the corner of Melrose Avenue for this five-story TOC development. The proposal is to set aside four of the units for low-income renters, Safai requests a 60 percent density bonus, a parking reduction, and three additional incentives through the TOC program. Safai purchased the property for $3.4 million in 2015. This is another Transit Oriented Communities project planned to rise to seven stories. The entity developing the property is Barrington Five LLC, based in the Pico-Robertson area. Steve and Pirooz Amona are connected to the entity, which purchased the property in late 2016 for $2 million. They would demolish two single-family homes on the property. In Tujunga, developer Hassan Soltani wants to demolish an eight-unit multifamily building to build a 37-unit project. Soltani purchased the property a year ago for $1.6 million. He’s requesting a density bonus and a maximum height increase to 44 feet from 33 feet. Three single-family homes would get the wrecking ball to make way for this four-story 32-unit project. The development seeks TOC bonuses and will set aside three units as affordable. The developer, David Hanasab, of Gramercy Holdings 26 LLC purchased the three properties for $3 million in 2016. 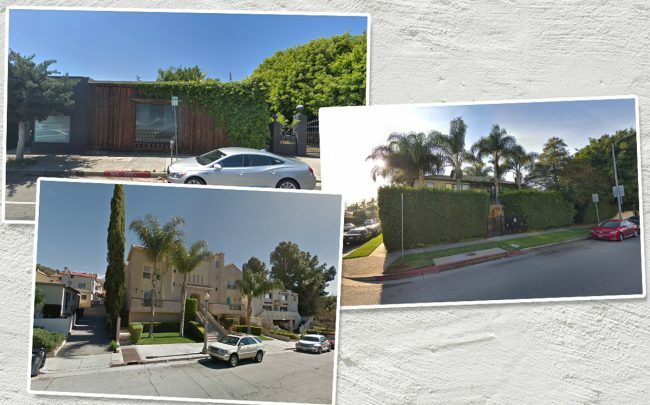 Developer Ofer Dayan purchased this Panorama City property in February 2018 for $1.3 million and plans to replace eight units there with a 26-unit TOC project. Dayan requests a density increase, an increase in floor-to-area ratio, and a parking reduction for the project. Six of the units would be set aside for low-income renters, more than the minimum required by the program.